Vignobles Mayard has a long history in the Southern Rhone Valley that dates back to 1898, the year the estate was created. The vineyards were replanted after the Phylloxera crisis destroyed much of Europe’s vines. While the family of Gratien Mayard immigrated to America following the devastation of their vineyards, Gratien Mayard remained in Chateauneuf du Pape. The son of Gratien Mayard, Alphonse Mayard founded Clos du Calvaire, which earned fame as they were one of first wineries in Chateauneuf du Pape to produce, bottle and sell wine under their own name. To celebrate that fact, the Mayard family created a special wine as a hommage to their achievement. Vignobles Mayard is still owned by direct descendant of the founder today and is managed by Marie Louise and Alphonse Mayard. Vignobles Mayard is a large estate with 43 hectares of vines in the Chateauneuf du Pape appellation. Their vineyards include 8 hectares of vines planted in the famous La Crau lieux dit. 40 hectares are used for red wine grapes. 3 hectares are reserved for the growing of white Chateauneuf du Pape grape varieties. Vignobles Mayard also owns a small parcel of vines in the Cotes du Rhone appellation. As well as being wine producers, the Mayard family also owns a negociant company. Vignobles Mayard completed a massive renovation of their wine making facilities, cellars, offices and tasting room in 2011. That same year, Vignobles Mayard brought in Philippe Cambie to help consult on their wine making and vineyard management. Vignobles Mayard produces 3 red Chateauneuf du Pape wines and 1 white Chateauneuf du Pape wine. Vignobles Mayard Clos du Calvaire is a blend of 80% Grenache, 10% Syrah and 10% Cinsault from vines that are 40 years of age on average. The terroir is galets and limestone. 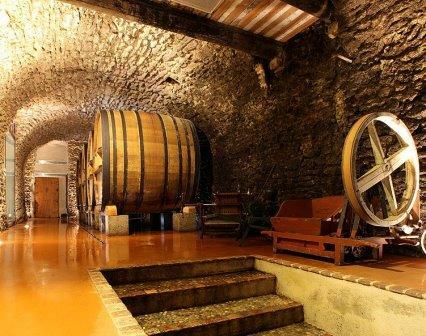 The wine is aged in cement vats. Close to 3,500 cases are produced each vintage. Vignobles Mayard Domaine du Pere Pape is produced from a blend of 60% Grenache, 20% Syrah, 15% Cinsault and 5% Mourvedre. The vines are more than 50 years of age on average. The wine is aged in foudres for 12-18 months before bottling. The annual production is close to 5,500 cases per vintage. Vignobles Mayard La Crau de Ma Mere is their top wine. The blend is usually 60% old vine Grenache, 30% Mourvedre and 10% Syrah. As you can surmise, the vines are planted in the famous La Crau vineyard. The grapes are 100% destemmed. The wine is aged in foudres for 12-18 months before bottling. The Mourvedre and Syrah can be aged in French oak barrels while the Grenache is always aged in foudres. Production is close to 750 cases per year. Vignobles Mayard Chateauneuf du Pape Blanc Crau de Ma Mere is a blend of 30% Grenache Blanc, 30% Clairette, 30% Bourboulenc, 8% Roussanne and 2% Picpoul. The wine is aged in a combination of 50% stainless steel tanks and the remainder is aged in French oak barrels and demi-muids. Vignobles Mayard can be enjoyed on the young side. Young vintages can be decanted for about 1 hour, give or take. This allows the wine to soften and open its perfume. Older vintages might need very little decanting, just enough to remove the sediment. Vignobles Mayard is usually better with 3-5 years of bottle age. Of course that can vary slightly, depending on the vintage. In the best vintages the wine should be consumed within 5-15 years after the vintage. Vignobles Mayard is best served at 15.5 degrees Celsius, 60 degrees Fahrenheit. The cool, almost cellar temperature gives the wine more freshness and lift. Vignobles Mayard is best served with all types of classic meat dishes, veal, pork, beef, lamb, duck, game, roast chicken, roasted, braised, stewed dishes, sausage, grilled meats, barbecue and cassoulet. Vignobles Mayard is also good with Asian dishes, hearty fish courses like tuna, mushrooms, cheese, pasta, eggplant and tomatoes. The white wine of Vignobles Mayard is best served with a myriad of different seafood dishes, shellfish, crab, lobster, sushi, sashimi, chicken, pork and veal, as well as Asian cuisine. Polished, sweet and fresh, there is an elegant texture to the juicy, sweet kirsch that is complicated by spicy notes and soft, round tannins. The finish delivers a bowl of fresh, juicy, cherries. The wine was made using 70% Grenache, 20% Mourvedre and 10% Syrah. A nice mineral note pops right up, just before you find the lush, red fruits. Sweet and silky, with freshness and purity, the wine was made from a blend of 60% Grenache, 20% Syrah, 15% Cinsault and 5% Mourvedre. Earthy, with garrigue and spice. There is a sweetness and elegance to the fruit, polished tannins and freshness in the finish, making this a really fine wine. The wine is made from a blend of 70% Grenache, 15% Syrah, 10% Cinsault and 5% Mourvedre. A success for the vintage, the wine is medium bodied, finesse styled, and shows a strong kirsch note, spicy red fruits and pepper in its already open and drinkable character. The wine was made from a blend of 60% Grenache, 20% Syrah, 15% Cinsault and 5% Mourvedre. Medium bodied, soft, forward, fresh, sweet, round, textured wine that is going to be ready to drink on release. The red berry filled wine leaves you with a spicy, black raspberry note in the finish. Baked cherries and spice, with soft textures and a forward attitude, ending with a splash of kirsch and pepper accompanied by lush textures. Flashy, lusty, red fruits, with freshness and a peppery, floral, thyme and cherry nose, this is tasty from start to finish. This wine was a new discovery for me. I'm looking forward to tasting future vintages of it. With a nice shot of fresh, sweet cherries in the nose, this forward, silky, smooth medium bodied wine. Medium bodied, forward, fresh blend of 60% Grenache, 30% Mourvedre and 10% Syrah delivers a spicy, floral, black raspberry and thyme infused character that drinks well young. Richly textured, luscious, sweet, fresh, ripe, red fruits, coupled with aromas of flowers, licorice and peppery spices are easy to find. There is no reason to wait to pop a cork with this beauty. Just a super wine with loads of fleshy, sweet, ripe, plums, cherries, spice and thyme. The wine offer good concentration, supple textures, freshness and a blast of fruit in the finish.